You may get tired of your browser nagging you to update to the latest version, but there’s a good reason why it does: having an out-of-date browser leaves your computer susceptible to hacking and viruses. Because hackers are constantly blowing through every firewall, cracking tough passwords, and breaking into some of the most secure systems, the only way to keep hackers in check is to continually change the very systems they want to hack—including your web browser. After all, with your browser you can give them access to the sites you visit, the credit cards you pay with, and the personally identifying information you submit. Every piece of that data is of extreme value to a hacker. Another good reason to do those updates? Browser updates also support the most up-to-date web design features too. Some websites may not support an old browser well, leading to a cluttered and messy looking website. Others won’t support the browser whatsoever (both for design and security protocol reasons), leaving you unable to access the site. Second, update your browser if it’s not current. Each browser has a different updating process. You’ll need to follow the directions for each one, but we’ve rounded up the most popular here. On a PC, you’ll have to click the ellipses in the top-right corner and hover over the “help” menu. From here, click “about Google chrome” to get to the same page that will search for updates. Firefox’s settings are nearly identical to those of Chrome’s and the program also automatically checks for updates every few hours. Usually, if you wait a few hours after receiving a web browser error message, your Firefox browser will update itself. If the problem still persists, it again may be that this auto feature has been turned off or blocked. You can check on this by similarly going to “about Firefox” under “help” and checking for updates and updating your auto update settings. While Safari automatically checks for updates, it doesn’t automatically start them. A notification will pop up on the top right hand of your screen when an update is available. If you want to check for updates yourself, click the apple icon and select “software update…” This will bring you to the app store and show all of the updates available for your computer, and the browser update will often be lumped into a software update. We recommend starting all available updates, but you can limit it to the Safari update by clicking “more” and selecting only the Safari option. Things start to get a little more complicated with Internet Explorer. In 2016, Microsoft announced it would stop supporting all versions of Internet Explorer besides version 11, as all other versions have been described as unsafe and are not recommended for use. Windows XP (which is no longer supported by Microsoft), Vista, 8, and RT (a mobile operating system) do not support Internet Explorer 11. This means if you want to use Internet Explorer and still surf safely, you may need to switch browsers or get a new operating system altogether. 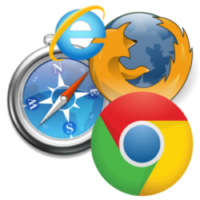 XP and Vista are supported by other browsers such as Opera and Lunascape. If you’re running Windows 10 or newer, Microsoft recommends users switch to their new browser, Edge. If your computer can’t or won’t update your browser, it could mean two things: 1) your operating system is too old or, 2) your hardware is too old to support the new security updates. In fact, these issues are quite often related. Your hardware won’t support the newer operating systems, so your browser can’t update. If the operating system or device is not compatible with the new browsers, it may mean it’s time to go shopping for some new hardware. This may seem frustrating, like a means for big companies to cash in by changing the playing field. However, this actually isn’t really the case–these changes happen frequently to protect your data and security. Now it’s on you to make sure it happens so you can be the safest you can be online. The Opera browser is often left unmentioned but wanted to make folks aware of it. Take a peek & play with it, i think you will like it. My browser is Safari. It says it is up to date. I have version 5.1.10 (6534.59.10 I can not get to my e-mail. Is my browser too old? James, please do give us a call and speak with our repair team. They can troubleshoot with you and figure out what’s going on (1-888-225-5837).